The availability of superfast broadband has jumped in Wales, with eight in ten (85%) properties able to get a connection. The findings are part of Ofcom’s Connected Nations 2016 report – the most authoritative, in-depth look at the state of the UK’s telecoms and wireless networks. This year’s report shows good progress on the availability and take-up of communications services, which are crucial to people’s personal and working lives. Two years ago, superfast broadband was only available to just over half (55%, or 780,000) of premises in Wales – the lowest of any nation in the UK, and 20 percentage points lower than the UK average at the time. This has now jumped 73,200 in a year, to 1.23 million premises, from 1.14 million, driven largely by the Welsh Government’s Superfast Cymru programme. In the past year, those able to get a superfast connection as a result of the Superfast Cymru programme has increased 6%, to 620,611 premises. The programme aims to reach 690,000 buildings by the end of 2017. However, the report finds there is more to do – particularly in boosting mobile and broadband coverage, and improving the quality of service provided by telecoms companies. Rural areas still lag behind on broadband, and Wales has the second-highest proportion of rural properties among the UK’s Nations. This brings increased challenges for providers when rolling out of 4G mobile and superfast broadband connections. Around three in ten properties – over 94,000 – in rural areas cannot get a connection of over 10 Mbit/s, which is the tipping point after which most people rate their broadband experience as ‘good’. This is often because they are situated a long way from the local street cabinet or telephone exchange. To help close this speed gap, Ofcom has today set out its technical advice for the UK Government on implementing its plans, announced in 2015, for universal broadband. Today’s Connected Nations report also presents the current level of mobile coverage across the country. While the picture is improving, with 4G reaching more premises, coverage still falls short and Ofcom wants to see better coverage across the UK’s landmass. So we have begun discussions with mobile operators to look at radical and ambitious solutions to deliver universal mobile coverage, to keep pace with consumers’ needs. The number of properties lacking access to decent broadband has fallen significantly in recent years, and is likely to fall further, given on-going investments by industry and Government. But the universal service would ensure every home and small business in the country has the right to a decent, affordable broadband connection of 10 Mbit/s or above by the end of the current parliament. 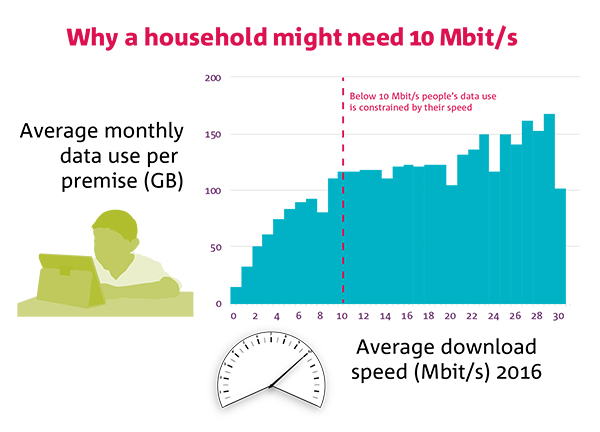 Ofcom’s analysis shows that this speed is sufficient to meet the current needs of a typical household. The online activity of users who can access this speed is far less constrained than those who cannot. However, households are likely to need greater speeds as new, data-hungry applications emerge. We will therefore monitor the universal service and recommend its minimum speed to rise when necessary. The final design of the service will be decided by Government, and then implemented by Ofcom. We have today set out technical advice to inform the Government’s decisions on factors such as speed, eligibility, affordability and funding. a 10 Mbit/s download speed; a more highly specified version of this service, including a 1Mbit/s upload speed; and a superfast broadband service. Government has said its preference (PDF, 156.4 KB) is for the universal service to be funded by industry. Under this model, the companies providing the universal service would recover any unfair cost burden from a fund paid into by a range of telecoms companies. Mobile coverage in Wales has improved in the past year, but there is more work to do before voice and data services match consumers’ rising expectations. Some seven in ten (73%) of premises in Wales can now receive an indoor voice service from all networks, up from 65% last year and indoor data services are available in over half (57%) of premises, up from 47% last year. In geographic terms, Wales has more voice not spots (12%) than the UK (10%). But for data, Wales ranks the same as the UK as a whole, with about 16% of the landmass not covered from any operator. Geographic voice coverage from all operators in Wales is 52% (UK 66%) but geographic data coverage from all operators is only 27% - almost half the UK average. Mobile phone users increasingly need coverage everywhere, so Ofcom is examining how it can help make that happen. We are also calling on all operators (PDF, 41.9 KB) to go beyond current targets by exploring options for reaching areas without premises – such as transport lines and remote locations. Rhodri Williams, Ofcom’s Director in Wales, said: “We’ve seen a dramatic improvement in the availability of superfast broadband in recent years and both the Welsh and UK governments have plans in place to deliver further improvements. Ofcom has also published its International Communications Market Report 2016, which compares communications services in 19 major countries. Among these, the UK has the fifth best availability of broadband services offering 10 Mbit/s or above – ahead of almost all European countries, but behind Singapore, Japan, South Korea and the Netherlands. The UK also performs well on the availability of broadband connections involving fibre optic cables – such as fibre running to the street cabinet – ranking fifth behind the Netherlands, South Korea, Japan and Singapore. However, Ofcom remains concerned that the UK has low coverage of ‘full fibre’ broadband, where cable and fibre lines connect directly to homes and offices. Here the UK ranks seventeenth out of 19 countries. To address this, Ofcom is requiring BT to allow other providers to use its infrastructure to build their own fibre networks, directly to premises. The UK performs well on prices, ranking second – out of five major European countries, plus the USA – for the cheapest communication services. Low prices in the UK were largely driven by cheaper mobile phone services, particularly for tariffs that include a high data allowance. People can check whether their mobile reception and home broadband connections are giving them the best service, using the new version of Ofcom’s app for smartphones and tablets, launched today. The Ofcom Mobile and Broadband Checker now checks the performance of the user’s mobile reception, as well as their home broadband. If the app finds a problem with either, it will explain possible causes and provide practical troubleshooting advice. The app also shows voice, 3G or 4G coverage from all major network operators, both indoors and outdoors, at any location in the UK – allowing people to compare which network offers the best service in places such as the home or office. Broadband availability and speed information is available using address-level data for the first time. The app is free to download and available for both Apple and Android devices from the Apple App Store or Google Play. It is also available as a web based version for desktop and laptop devices. The app is available for download in Welsh. This is the first time that Ofcom has published an app in Welsh and does so in advance of being required to do so under the new Welsh Language Standards which are effective from the end of January 2017. Other technical characteristics for Scenario 2: latency (medium response time), maximum sharing between customers (a ‘contention ratio’ of 50:1), and a defined data cap based on current usage profiles (100GB per month). Other technical characteristics for Scenario 3: fast response times, a ‘committed information rate’ of 10Mbit/s (i.e. guaranteed 10Mbit/s at all times) and an unlimited usage cap. These estimates are based on broadband delivered via a mix of networks, but mainly fibre and copper lines. Ofcom is concerned that people who buy landline services on their own are not being served well by the market. So earlier this month we announced a review of the retail market for standalone landline telephone services, to ensure that customers receive value for money. If all consumers chose the fastest available broadband service at their property, the average download speed would rise to an estimated 132 Mbit/s. Ofcom has today also published its ‘Smartphone Cities’ report, which compares the 4G mobile network performance of the UK’s four national mobile providers – EE, O2, Three and Vodafone. Testing was carried out in seven cities across the UK – Belfast, Birmingham, Cardiff, Edinburgh, London, Sheffield and Southampton – between July and October 2016.